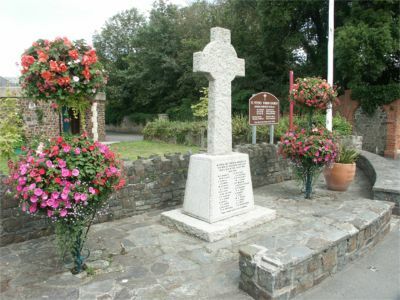 The Fremington War Memorial stands in a well-kept and conspicuous position beside the main road to Instow and Barnstaple. Behind, is St Peter's Church and the old Church Room. The Memorial consists of a roughly hewn Celtic-type granite cross standing on a plinth and base of granite. There are inscriptions on two faces of the plinth; that which faces the road contains the names from the 1914-1918 War; the side nearest to Barnstaple contains the names for 1939 - 1945. Private William Henry Bennett of the 1st Battalion, the Devonshire Regiment. Nephew of William and Elizabeth Ripley of Fremington and husband of Emma Bennett of Yellaford Cottage, Bickington, Barnstaple. Born in Langtree in the December Quarter of 1883. Died 8 October 1917 aged 34. Sergeant Walter William G. Cole of the 93rd Field Company, the Royal Engineers. Son of William and Mary Ann Cole of The Cottage, Fremington. Born in 1893 in Chelsea. Died 3 Nov 1918 aged 25. Lance Corporal Charles Cornish of the Foot Police, the Military Police Corps. Son of Samuel and Fanny Cornish of Muddlebridge, Fremington and brother of John below. Born in 1893 in Fremington. Died 22 Jul 1917 aged 24. Lance Corporal John Cornish of the 2nd Battalion, the Devonshire Regiment. Son of Samuel and Fanny Cornish of Muddlebridge, Fremington and brother of Charles above. Born in 1891 in Fremington. Died 1 Jul 1916 aged 25. Private William Henry Darch of the 2nd Battalion, the Devonshire Regiment. Son of Thomas Darch of Lovacott, Newton Tracey, Barnstaple and brother of Minnie Darch. Born in the December Quarter of 1893 in Abbotsham. Died 22 Aug 1916 aged 23. Private George Ernest Fisher of the Royal Buckinghamshire Hussars. Son of Thomas and Mary Ann Fisher formerly of Tawstock, later of 3, Deptford Villas, Barnstaple. Born in Tawstock in the September Quarter of 1876. Died 28 Aug 1915 aged 39. Ship's Cook Arthur William Gayton of S. S. Coquet (London), the Mercantile Marine. Son of William Samuel and Mary Elizabeth Gayton (née Passmore) of Rock Cottage, Bickington, Barnstaple. Born in the June Quarter of 1893 in Bickington. Died 6 Jan 1916 aged 22. Private Percival Tom Harding of the 2nd Battalion, the Grenadier Guards. Son of Tom and Janet Harding. Born in the December Quarter of 1890 in Brentford. Died 25 Sep 1916 aged 25. Civil Servant in H.M. Office of Woods, Forest and Land Revenues. Private Frederick John Harris of the Royal North Devon Hussars. Son of Samuel and Martha Harris of Fremington. Born in the June Quarter of 1885 in Fremington. Died 3 Feb 1919 aged 34. Buried in the churchyard of St. Peter, Fremington. Lance Corporal Reuben Harris of the 10th Battalion, the Black Watch. Son of John and Emma Harris and husband of Edith Mary Bartlett of 11 Priory Gardens, Pilton, Barnstaple. Born in the December Quarter of 1889. Died 2 November 1916 aged 27. Private Frederick Charles Hobbs of the 1st/6th Battalion, the Devonshire Regiment. Son of Charles and Emily Hobbs of Fremington. Born in the March Quarter of 1890 in Fremington. Died 14 Dec 1914 aged 24. Buried in the churchyard of St Peter, Fremington. Private Charles Ernest Huxtable of the 8th Battalion, the Devonshire Regiment. Son of John Huxtable of Fremington. Born in the March Quarter of 1893 in Bristol. Died 25 Sep 1915 aged 23. Sergeant Ernest Albert Huxtable of the 1st Battalion, the Devonshire Regiment. Son of George and Susan Huxtable of Fremington. Born in the September Quarter of 1888 in Fremington. Died 2 Nov 1916 aged 28. Private John Blackmore Huxtable of the 14th Reinforcements, the Auckland regiment of the New Zealand Expeditionary Force. Son of George and Susan Huxtable of Fremington and brother of Henry and Ernest above. Born in the June Quarter of 1876 in Fremington. Died 1 June 1915 aged 39. Private Reginald Herbert Huxtable of the Royal North Devon Hussars. Born in Fremington in the March Quarter of 1897. Died 20 October 1915 aged 18. 26708 Private Wilfred James Johns of the Devonshire Regiment's Labour Corps. Son of James and Fanny Johns of East Hele, Yelland, Fremington. Born in the December Quarter of 1891 in Fremington. Died 16 December 1918 aged 27. Buried in the churchyard of St. Peter, Fremington. 2nd Lieutenant Reginald. Percy Martin of the Royal Engineers. Brother to Edith, Jane, Julia and Albert Martin who lived on independent means at Westleigh. Born in the September Quarter of 1890. Died December 1918 aged 28. Buried in the churchyard of St. Peter, Westleigh. Lieutenant Cecil Mortimer Pitts Tucker of the 1st Battalion, the Highland Light Infantry. Son of William Edwin and Violet Emily Pitts Tucker of Crosslands, Barnstaple. Believed to have been born overseas. Died 21 December 1914 aged 24. This man's name does not appear in "Soldiers died" or on the Commonwealth War Graves listing but the brass plaque inside the church at Fremington identifies him as Private George Horatio Redmore of the 9th Battalion, the Devonshire Regiment. He is believed to be the son of Horatio and Laura Redmore of Newport, Mons. Born in the December Quarter of 1893 in Newport. Died 14 July 1918 aged 25. His grandfather had many family connections in the Fremington area. Private Percy Arthur Short of the 1st Battalion, the Essex Regiment. Son of William and Martha Short of Muddlebridge, Fremington. Born in the June Quarter of 1893 in Fremington. Died 4 December 1917 aged 19. Corporal R. J. Skinner of the 7th Battalion, the Royal Berkshire Regiment. Son of Mrs. J. Skinner of Bickington. Died 29 August 1916. Sergeant Samuel Trick of the 88th Coy., the Machine Gun Corps. Son of John and Elizabeth Trick of Roundswell. Born in the December Quarter of 1896 in Westleigh. Died 10 July 1917 aged 20. This man's name does not appear in the Commonwealth War Graves listing but the brass plaque inside the church identifies him as 658 Private William S. Tucker of the 6th Battalion, the Royal Leinster Regiment who died 29 March 1918. He was the son of John and Mary Jane Tucker (née Spearman) of Fremington. He died of wounds in the hospital at Alexandria 16 August 1915 aged 21and was buried there. .
Corporal Ephraim James Ward of the 1st/5th Battalion, the Duke of Cornwall's Light Infantry. Son of Ephraim and Louisa Ward of Muddlebridge, Fremington. Born in the December Quarter of 1894 in Fremington. Died 31 March 1918 aged 23. Private Alfred Charles West of the 2nd Troop, the Queen's Own Worcestershire Hussars. Son of Charles and Emily West of Fremington and husband of Augusta West of 2 Devonshire Place, Teignmouth. Born in the September Quarter of 1883 in Shaftsbury, Dorset. Died 29 March 1916 aged 33. Corporal Frank Heal Withecombe of the Royal North Devon Hussars. Son of Edward and Mary Maria Withecombe of Hilltop Farm, Fremington. Born in the March Quarter of 1893 in Fremington. Died 25 October 1915 aged 22. Guardsman Ernest T. Bartlett of the 9th Battalion, the Welsh Guards. Son of William and Edith Bartlett of Hackney, London. Died 11 November 1940 aged 20. Sub-Lieutenant Anthony William Duncan Beale of the Royal Navy, HMS Lanka. Son of Captain Richard George Forfeit Beale O.B.E and Mrs. Dorothy Alison Beale of Norwich. Died 5 April 1942 aged 21. Awarded the DSC. Major Robert Shirley Croot of the Glider Pilot Regiment, the Army Air Corps. Died 5 December 1944. Awarded the TD. Private George Henry Victor Easterbrook of the 1st Battalion, the Queen's Own Royal West Kent Regiment. Son of Bert and Alice Easterbrook of Bickington. Died 17 May 1944 aged 21. Gunner Leslie Cecil John Heard of 777 H.A.A. Regiment, the Royal Artillery. Son of John and Edith Heard of West Yelland. Died 25 July 1945 aged 37. Master Frederick Charles Nicholls of the Merchant Navy, S.S. West Wales (Cardiff). Son of William and Aleatha Nicholls and husband of Amy Roseland Nicholls of Instow. Died 29 January 1941 aged 46. Pilot Officer (Navigator) Charles Henry Nichols of the RAF Volunteer Reserve. Son of Henry and Florence Nichols, of Bickington. Charles Nichols was born 13 September 1923 at Withypool on Exmoor. Died 27 February 1943 aged 19. Air Mechanic 2nd Class Francis Arthur Squire (or Squires) opf the Royal Navy, HMS Indominatble. Son of Herbert and Alice Squires of Liverpool. Died 12 August 1942 aged 19. Not yet confirmed but possibly this is Fred, the son of Alfred Taylor, who was born in Bideford. Fusilier William Mark Bennett White of the 8th Battalion, the Royal Fusiliers (City of London Regiment). Son of Mr. and Mrs. T. White and husband of Polly Amelia White of Barnstaple. Died 23 February 1944 aged 36. Private Richard Henry White of the 1st Battlaion, the Devonshire Regiment. Son of Thomas Bennett White and Minnie beatrice White of Barnstaple and husabnd of Martha Teresa White of Barnstaple Died 13 April 1944 aged 25. Aircraftswoman 1st Class Loveday Hilda Pitts Tucker of the Women's Auxiliary Air Force. Daughter of Geoffrey Somerville and Isabella Winifred Pitts Tucker. Died 1 April 1942 aged 22.